A Story of Good and Evil, of Right and Wrong, of an Inspiring Football Coach, and of a Mobster Turned Murderer. Everyone comes in shades of gray, with a forward face and one kept in shadow. What happens when the darkness takes over, when action overrides intention, when what is done cannot be undone? 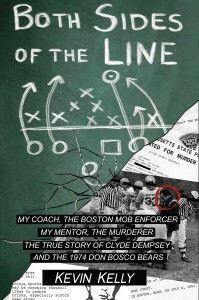 Kevin Kelly’s Both Sides of the Line tells the story of Jack Clyde Dempsey, a football coach at a Catholic school in Boston who forever changed the lives of countless young men. He brought unity and discipline to a motley group of inner city boys for whom football was a means to escape the many challenges of home life. With a reputation for toughness and unrelenting determination, Dempsey insisted that what he called “the Holy Trinity” of football—quickness, technique, and desire—would trump size and stature every time. And with this message and the success it wrought, he turned kids into believers. More than winners, his boys became teammates who supported one another. And while his team, his football family, quickly came to respect him for his unwavering faith in their potential, the truth was Dempsey’s storied and mythic “dark side” had preceded him. While revered by the streetwise boys before they ever laid eyes on him, Dempsey revealed in time an unapologetically volatile temper, and his whispered-about dealings with the local mob fed the rumor mill of Don Bosco High. In the fall of 1974, with team morale at an all-time low, Dempsey’s relentless drive for perfection led his undersized charges to a championship season—the first and only title in the Catholic Conference that Don Bosco’s football team would ever know. The crown became the driving force for many players’ self-esteem and confidence, as well as for their college and career success. For Dempsey, however, it became the towering peak from which he would tragically spiral, crashing in a blast of violence that ended another life. A football coach who preached God, family, and country, and the need to live a clean, drug-free life, allowed his penchant for drinking and cocaine to finally bring him down. That was when the hunt for Jack Clyde Dempsey, fugitive, began. This is the remarkable story of an unlikely team of champions from some of the roughest parts of Boston, and of the coach who inspired and shaped their futures. He gave them the strength to stand together, even as he self-destructed. This is Kevin Kelly’s memoir of Jack Dempsey: The man who played on Both Sides of the Line. I am enjoying Mr. Kelly’s book but I am surprised that a few obvious errors made it past the editors. Quite frankly, I’m surprised Mr. Kelly, as a born-and-bred Bostonian, made the mistakes to begin with. First is the name of the Boston Common. Maybe he was going for the vernacular effect but Common should not have been made plural. The next item that struck me was his placing the Boston Garden in the North End. My belief is that Washington Street has marked the border between the West End and the North End since the early 1900s and that the Garden has always been in the West End. The other thing I noted is that Mr. Kelly refers to the walk to practice as 3.5 miles. From my best measurement, the route is 1.5 miles at its longest. I understand that these are fine points but I really like the book thus far and I want it to do well.